How Rare Is A Sports Franchise Bankruptcy? June 29, 2011  Robert Siegel talks with bankruptcy lawyer Charles Tatelbaum, a partner at Hinshaw and Culbertson and former vice president of research at the American Bankruptcy Institute. 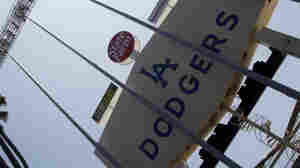 They discuss the Los Angeles Dodgers bankruptcy filing — and what is at stake for a franchise that files for Chapter 11 during the season. 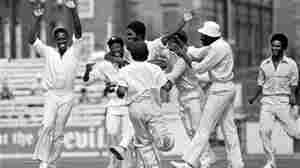 June 29, 2011  The cricket documentary Fire In Babylon is a fine example of a good movie that's coming to consumers through distribution channels they might not know to check. June 29, 2011  Roger Federer won't be in this year's Wimbledon final, as he lost to Jo-Wildried Tsonga Wednesday. It was the first time Federer had lost a match to Tsonga. North Korea: Soccer Players Hit By Lightning Before Loss To U.S.
June 29, 2011  It happened during training in North Korea, the women soccer team's manager says, and may have affected their play. Verifying the claim, of course, may be impossible. June 29, 2011  The University of South Carolina won its second consecutive College World Series Tuesday night, becoming the first team to go 10-0 in an NCAA tournament. The unlikely feat surprises even Ray Tanner, the team's coach. Hot Dog! It's Independence Day! June 29, 2011  Hot dogs are great to eat at sports events. But commentator Frank Deford doesn't think eating hot dogs should be a sports event. 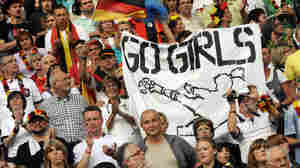 June 28, 2011  Sportswriter Stefan Fatsis joins Robert Siegel from Germany to talk about the first round of the Women's World Cup. June 28, 2011  VIDEO: Lorenzo Charles scoring the winning basket for coach Jim Valvano's "cardiac kids." After retiring from basketball, he became a bus driver. He was alone Monday when the vehicle he was driving crashed into some trees in West Raleigh, N.C.
June 28, 2011  Team owner Frank McCourt says bankruptcy was the only option after Major League Baseball rejected a television deal with Fox Sports. June 27, 2011  Major League Baseball recently rejected a TV deal for the Dodgers that team owner Frank McCourt said would provide financial stability for the team. McCourt then filed bankruptcy in hopes of staving off the MLB. June 27, 2011  Both Serena and Venus Williams were eliminated from Wimbledon's singles tournament Monday, ending a streak of success at the grass event.Their exit means that for the first time since 2006, neither Williams sister will play in the Wimbledon women's singles final. June 26, 2011  Wimbledon isn't the only big tournament to captivate the sports world this summer. Soccer fans will have three weeks worth of the FIFA Women's World Cup in Germany, starting Sunday. Guest host Susan Stamberg speaks with NPR sports correspondent Tom Goldman about the 2011 FIFA Women's World Cup. June 26, 2011  This year marks the 50th anniversary of Billie Jean King's first title at Wimbledon, at the age of 17. This year is also her 50th consecutive Wimbledon. Guest host Susan Stamberg talks with tennis legend about how the game has changed.